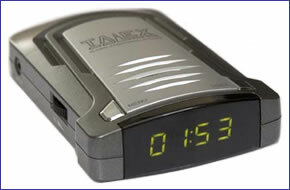 Talex speed camera detector alerts the driver to fixed and mobile speed cameras. Talex then gives the speed limit at speed camera site with spoken voice alerts and clear LED display. Talex comes with a 12 months free subscription period and is pre-loaded with the latest speed camera database, ready to use immediately. Accessories are still available for your Talex click here. The Talex is 100% legal, state of the art speed camera detector. Talex comes pre-loaded with a comprehensive speed camera database updated by ex-Traffic Police, and is ready to use straight from the box with a further 12 months subscription included. Talex provides information of fixed, mobile and red light camera positions and accident black spots, making clear voice announcements. Talex will warn you to reduce your speed if you are approaching a speed cameras site above the speed limit. Talex GPS speed camera alert system features an LED display, which provides the user with additional information to the voice announcements. Whilst driving the Talex will display the current speed of your vehicle. On approach to a speed camera location Talex first sounds a chime followed by an voice announcement such as 'Warning speed camera 500yards ahead - limit 30mph'. This will typically happen at 500yards from the speed cameras position, (in some cases a 500yards warning is not ideal because of the road layout). A second chime is heard at 200yards from the speed camera site, and if the vehicle is still over the speed limit, a continuous warning is heard 'Warning - reduce speed' until the vehicle speed drops to the speed limit, or the speed camera site has been passed. Although this Talex system benefited from the lowest subscription on test - £29 is around half the cost of the most expensive - there were no holes in the database. Indeed, it also unearthed all the known mobile sites. We liked the clear female voice, revealing the type of trap ahead and the speed limit (the latter also flashing on the display). And while it's not the most stylish product on test, this is extremely good - and a worthy Recommended unit. The Talex is easy to install, taking seconds to install and remove from your vehicle. The Talex is installed on your dashboard via the supplied Magnetic Mount, then simply connect the Car Power Lead and your ready to use your Talex. Also available for the Talex is the option to install via suction cup mount on the front windscreen via the Talex Screen Mounting Kit. View the Talex Screen Mounting Kit. The Talex comes with a speed camera database pre-loaded into the unit and is ready to use immediately. Talex also includes free 12 months subscription to the speed camera database and includes a (USB) PC cable and software disc to enable users to update the unit via an internet-enabled computer. Want to add accessories to your Talex? We sell a very limited selection of genuine Talex parts and accessories.